Solomon topples Harper in Chess Clash! FM Kenny Solomon of South Africa relished the opportunity to participate in the "2nd Annotation Chess Clash," and mentioned that it would help him prepare for the pending African Championship starting October 4th. He would face the reigning champ, FM Ryan Harper of Trinidad who last year defeated Jamaica's FM Warren Elliott in the inaugural contest. 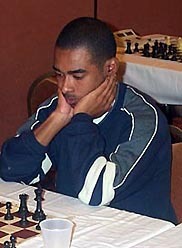 Harper is the 2002 Trinidadian National Champion and an official vendor at the Internet Chess Club (ICC). Both players demonstrated their prowess in annotating the classic Kramnik-Kamsky (World Championship Qualifier, 1994). The final tally on 181 votes was 64.64% for Solomon and 35.36% for Harper… a surprising margin. Voters around the world appeared to enjoy Solomon down-t0-earth narrative style and use of diagrams. Harper got praise for his depth and detail of key variations. There were many useful comments by the voters. Players from around the world participated and publicity was tremendously bolstered by an announcement at ChessBase.com. Thanks to everyone who participated and for the valuable feedback to both players! Stay tuned for the next Clash!